A Christmas Carol :: Movie Information :: RabbitTV GO! One of the best-loved holiday stories of all time is back in this animated, musical version of Charles Dickens' most famous tale. 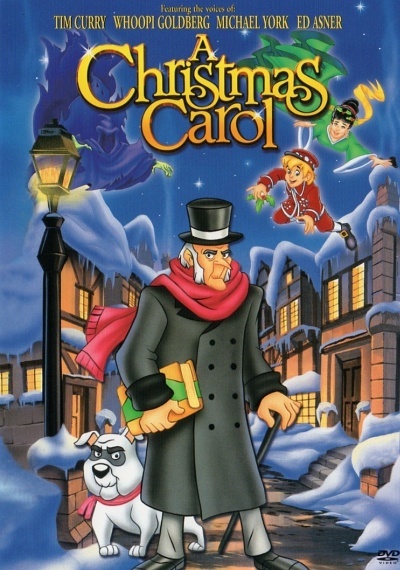 An all-star voice lineup features Whoopi Goldberg, Ed Asner, Michael York and Tim Curry as Scrooge. Come share the joy as cold-hearted Ebenezer Scrooge, the man who "bah-humbugged" his way through Christmas, discovers the true holiday spirit after he's visited by the Ghosts of Christmas Past, Present and Future. With original music and eight great songs, this uplifting, animated tale is destined to become a new holiday classic.